An entire chocolate cake. A gallon of espresso. A liter of Jameson. For the average person, it’s probably not wise to consume any of these things in one sitting, regardless of how tempting it might be. Ethel Rohan’s debut collection Cut Through The Bone should be read with that same restraint, because overindulging yourself on the words therein will have you rolling around on the floor, your bed, they’ll have you pacing the halls, holding your head in your hands, heartsick and longing. I should know, because I ate too much too quickly and it happened to me. The stories in this collection—many only a few pages long—are extremely potent. Pungent. Deceptively rich. Like stepping into a puddle and being swallowed whole. Whoops. There goes your umbrella. Rohan writes about loss, about being trapped, about desperation, delusion. And she does so with a hand so steady you might think she’s a doctor slicing open a patient with a scalpel. And you’d be right, at least in part, because that’s precisely what she’s doing. Only you’re not simply observing. You’re the patient. Visceral. The word visceral comes to mind. Rohan’s writing is exactly that, and it’s because she writes about things we all feel, that we’re all familiar with: loss and absence. Rohan explores the profound effect these two things have on the characters in her stories as individuals, within the family dynamic, and sometimes as complete strangers. What’s interesting (and amazing) about this story is that the widow isn’t simply mediating on the loss of her husband, but she’s also mediating on his loss, the loss of his arm during the Korean War. It’s an excellent layer that adds to the connectedness of the characters here, whether present or not. Here, and throughout the collection, Rohan employs a technique reminiscent of Joyce’s Finnegan’s Wake, where the dead provoke the actions of the living, thus making them—ironically—integral, present players within the narrative. This story touches upon the sometimes crushing responsibilities that come with having a family. It also acts as a reminder of the necessary sacrifices we have to make in life, sacrifices that bubble to the surface time and again to punch, kick. In just a few short pages, Rohan captures the desperation of a dream being drowned and the claustrophobia of the prison cells we sometimes make, perhaps unwittingly, of our lives. However, the characters in Cut Through The Bone don’t always suffer and scream alone, and in that we can find some sense of togetherness, a collective limping along. “Maybe she could sleep with us tonight?” she asked. This story is particularly heartbreaking because it invites us to laugh at times, even if uncomfortably. It’s an empowering story of slipping the noose of heavy thoughts and a dead marriage. 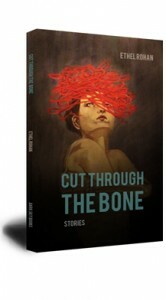 The stories in Cut Through The Bone are by no means pills to be taken lightly, but they are meant to be taken. Just don’t do what I did. Read this tight collection slowly and carefully. Savor it. Savor the black pills. Let them melt in your stomach. Let them move you. Let them inspire you. Let them remind you of what’s important in your life. Ethel may write about loss and absence, but make no mistake, her book is very much present, and she’s a voice that’ll be around for a long, long time. Purchase Cut Through the Bone HERE.